On this date in 1835, Richard Lawrence became the first person in history to attempt to assassinate a United States President. Lawrence, who fancied himself King George III of England, blamed President Andrew Jackson for a host of things, including the death of his father. Lawrence purchased two pistols, and then, in true “deranged gunman” fashion, he tracked Jackson’s movements for some time before making his move (he must have seen Taxi Driver). On January 30th, he attempted an ambush as the President was leaving a funeral service. He aimed one of his pistols at Jackson’s back and pulled the trigger. Misfire. Then he aimed the second pistol and pulled the trigger. Same deal. And since he didn’t have the foresight to arrange for a backup shooter in the grassy knoll, Lawrence’s assassination attempt fell flat. And so did Lawrence, after the crowd, which included Congressman (and King of the Wild Frontier) Davy Crockett, tackled him. Rumor has it that even the President got in on the act, whacking the wannabe shooter with his cane for good measure. Lawrence was tried and found not guilty by reason of insanity. He spent the remainder of his life in an insane asylum that would later house future wannabe assassin John Hinckley. 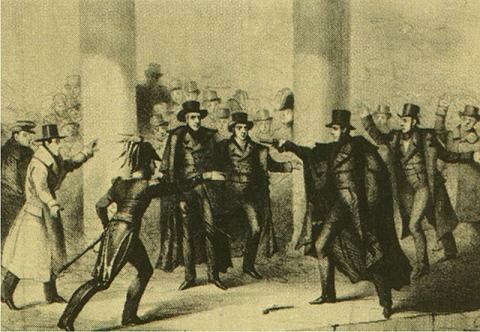 For years there was speculation that Lawrence was put up to the assassination attempt by enemies of President Jackson, but there was never any evidence to support the charge. A conspiracy? No evidence to prove its existence? I’m thinking we have Oliver Stone’s next movie here.